Ted Green presented research on "place based education" in teaching history. School of Education professor Ted Green and adjunct faculty member Tom Zinselmeyer presented this month in Washington, D.C., at the 29th annual National Council for History Education Conference. Their presentation, "How Can Place Based Education Inform Children of Their Historical Roots?" explored the tenets of place-based education and how collaboration between museums, educators, and historical societies can be used to engage early adolescent learners. This was part of a larger case study conducted by Green and Webster University graduate student Ben Williams, JD, highlighting social justice issues within the context of the Dred Scott decision, nationally significant historical sites built with enslaved people, local turn-of-the-19th-century privileged neighborhoods, and the exploration of religious tolerance in public and private educational institutions during the 1920’s-1980’s using archival research. Green and Williams presented initial findings of their research at The Henry Ford Museum in Dearborn, Michigan, last November at the Midwest Outdoor Coordinating Council Autumn Conference. This project encouraged students to develop historical empathy while engaging them in social justice issues to improve their historical literacy skills. For more information, contact Green at tgreen@webster.edu or 314.246.7971. Donald Miller has written an exhaustive "teens and media" reference book, "Coming of Age in Popular Culture: Teenagers, Adolescence, and the Art of Growing Up," published by ABC-CLIO. With each new generation since the 1950s, a symbiotic relationship is noted between teenagers' coming of age experiences and the popular media of the time. Miller's text "covers a breadth of media presentations of the transition from childhood to adulthood from the 1950s to the year 2010. It explores the ways that adolescence is characterized in pop culture by drawing on these representations, shows how powerful media and entertainment are in establishing societal norms, and considers how American society views and values adolescence." Miller is a Webster University alumnus (Class of 2007) and adjunct faculty member in the Webster University School of Communications. Learn more about the text at ABC-CLIO and in this Out in STL interview with Miller. John Chappell presented a paper, "Carole King's Consciousness Raising Path to Tapestry" at the 40th annual Southwest Popular/American Popular Culture Association Conference in Albuquerque, New Mexico, on Feb. 23. 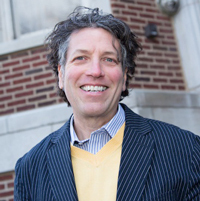 Chappell is professor of history in the Webster University College of Arts & Sciences.